Keep your business moving with professional engineering, expert advice, and the industry’s top conveyor equipment, from steel belt conveyors to slider bed conveyors, including SteelTrak™ and PlastiTrak™. New London Engineering also offers conveyor replacement parts, 24-hour shipping through UPtime Express™, and accurate conveyor quotes. Our conveyor solutions can maximize your product manufacturing, material handling, or scrap removal. 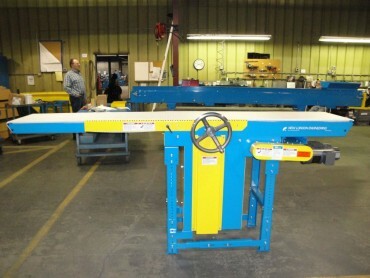 Extendable conveyor with nose bar transfer for small part transfer. 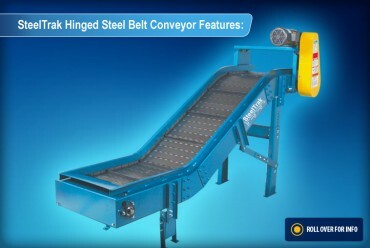 A true workhorse, these conveyors offer a selection of long lasting belts and the ability to convey and transfer a wide variety of products with special handling needs. Get maximum flexibility in your conveying configuration: straight or curved, incline or decline. Change as your needs change and save money. These low profile conveyors stand up to extreme conditions and fit in tight spaces. Features include knurled drive pulleys to prevent belt slippage, long lasting bearings, endless belt quick change system, heavy 12 gauge frame and 3 ¾" of belt take up. Many configurations ship within 48 hours.